One of the first books I ever reviewed on this blog, back in 2011, was The Watchers by Jon Steele. It had a profound effect on me. I’m not normally a fantasy reader but that didn’t seem to matter here as it slowly and magnificently pulled me out of the real tangible world around us into another side of life – one in which demons and angels walk among us, and have done through history, and where the future of humanity rests in the hands of the very few. It is a story carried out on two scales, one of which is enormous and apocalyptic and the other small and intimate. It continued with Angel City in 2013, a novel at least as good as its wonderful predecessor, and the Angelus trilogy is now completed with The Way of Sorrows. 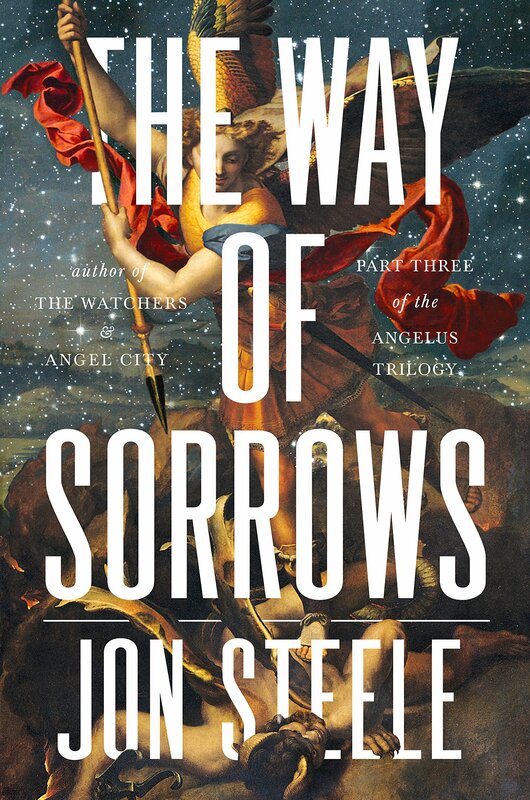 The Way of Sorrows is Jon Steele’s masterpiece, but to appreciate it fully you must read the preceding two novels first – without them it would make little sense and, anyway, why deny yourself the pleasure? Now the trilogy is complete, you needn’t wait two years between each book. They are yours for the taking. Having said all that, please tread no further if you’ve not read The Watchers and Angel City. Spoilers for these are inevitable now that we reach the extraordinary climax. As the novel opens, Katherine (Kat) Taylor has been separated from her son Max in a storm of violence that she can barely recall. He has been torn from her, their protectors slaughtered, and Kat is resigned to burying the dead bodies of people she knows she should remember, aware that something precious has been taken from her and trying hard to remember what. Kat is caught in a time bubble, another dimension that may ensnare her for eternity if it collapses before she is rescued. Jay Harper is Kat’s guardian angel in more ways than one. He is a detective, working for the enigmatic Inspector Gobet, and Kat is in his charge. But Jay is recovering from an assault of his own, coming to awareness by Lausanne Cathedral, the home of the flame of life, guarded in its lantern by the watcher of the bells. There are casualties, the forces of evil are strong, and Jay needs help. It’s just as well that it’s at this point that Krinkle, the ex-roadie of the Grateful Dead, turns up and gives Jay the push he needs to pick himself up and rescue Kat and find Max. What follows is an intense, at times traumatic, sometimes touching on the bizarre and always compelling journey to find Max and save him before he can be destroyed by Russian billionaire Komarovsky. In this universe, Russian billionaires are not all that they seem and this one is nothing at all as he seems. The climax when it comes is staggering, earth shattering and one of the most thrilling scenes that I’ve read, the action mixing with moments of sheer emotion and tenderness. The Way of Sorrows is a beautifully-written novel that at times soars into poetry as it deals with some of the profound feelings of life. But there is a quirkiness to it that lifts the mood when needed and adds something very special indeed. How could there not be humour when one of the main characters is an irascible roadie? Kat has a fine sense of humour of her own – just as well in the circumstances – as does Jay. There are some fantastic set pieces but, really, everything is overshadowed by the gobsmacking conclusion that more than does justice to the trilogy. Jon Steele knows how to write, he knows how to care, and he certainly knows how to write thrilling plot as well as poetic prose. His characters are delicately drawn, they’re unconventional in more ways than one (not just in the obvious), and some of the minor characters are as memorable as the main. And there’s another reason why I love The Ways of Sorrow so much – there is a touch of something scientific here, there is a reach out from the planet, an extra mystery that when it arrives makes perfect sense. I adored that. You must read more to discover why. I had just the one minor issue with The Way of Sorrows – it had been two years since I read Angel City and the opening of this novel made no allowances for the passage of time. The first few chapters are confusing. However, this passes and everything soon falls into place. The Way of Sorrows is a powerful, ambitious novel, steeped in fantasy, legend and history, presenting a tensely dangerous, sometimes humorous and often tearfully moving world in which angels walk among us, albeit sometimes disguised as police and Grateful Dead roadies. The ending is spectacular and brilliantly located – a magnificent, fitting conclusion to a trilogy the like of which I doubt I’ll read again. This entry was posted in Fantasy, Review, Thriller and tagged Fantasy, Thriller on August 4, 2015 by Kate (For Winter Nights). Hmm hubby has somehow nabbed this series as ‘his’ but actually you’ve convinced me more than he has that it’s worth a read! Mary, you must nab it back! !